Let’s say that you’ve just created the perfect overview of your company’s products or services. Perhaps you delivered the presentation to potential investors or clients. The content is so basic, that you’d like re-use it. Why not display it at a kiosk at the next trade convention? Why not put it on your Web site? 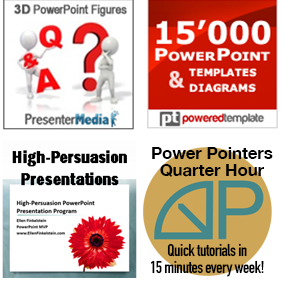 This is a viewer-controlled presentation; there is no presenter. You kept your text succinct and used lots of images so that your audience would pay attention to you rather than your slides. When delivering your presentation, you explained your points more fully and answered any questions that came up. Have you ever read the presentations of other companies on the Web? Did you know that you can find PowerPoint presentations at Google by entering filetype:ppt? 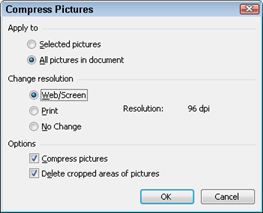 For example, enter company overview filetype:ppt. I’ve no idea what it means. Neither will anyone else. The basic principle for converting a delivered presentation to a viewer-controlled presentation is to expand the text, tables, and charts so that they are self-explanatory. After all, no one is explaining them. In place of short bulleted text, you need full, or almost full, sentences. Make the connection between topics completely clear. Write out assumptions and conclusions. An alternative is to add narration. One of the most annoying features of the presentations I read on the Web was the constant use of abbreviations, acronyms, and technical jargon. Instead, write out the abbreviations and include definitions for technical terms. 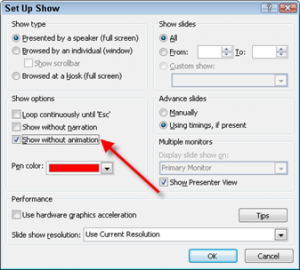 Slide transitions may work fine when the audience is sitting 10 feet away, but up close, two feet from a computer monitor, the same transitions may strain the eyes. It’s better to remove all your transitions before putting the presentation at a kiosk or on a Web site. As a reality check, find a couple of friends or colleagues and ask them to view the presentation. Don’t add any explanation. Ask them to write down what they understood and what was unclear. Their comments should help you to make the necessary adjustments.